Doctors and pharmaceutical companies make money from it. That's the only reason chemotherapy is still used. Not because it's effective, decreases morbidity, mortality or diminishes any specific cancer rates. In fact, it does the opposite. Chemotherapy boosts cancer growth and long-term mortality rates and oncologists know it. Obviously, there are people in the know who have understood that sodium bicarbonate, that same stuff that can save a person's life in the emergency room in a heartbeat, is a primary cancer treatment option of the safest and most effective kind. It is also a powerful buffer against radiation exposure, so everyone should be up to speed on its use. Everybody's physiology is under heavy nuclear attack from strong radioactive winds that are circling the northern hemisphere. Keeping our pH within a healthy range also involves necessary lifestyle and dietary changes that will protect us over the long term while the use of sodium bicarbonate gives us a jump-start toward increased alkalinity. When the body can no longer effectively neutralize and eliminate the acids, it relocates them within the body's extra-cellular fluids and connective tissue cells directly compromising cellular integrity. Hydrogen ions tie up oxygen. That means that the more acid a liquid is, the less available the oxygen in it. Every cell in our body requires oxygen for life and to maintain optimum health. Combine that with what we know about hydrogen ions and we see that the more acid the blood (the lower its pH), the less oxygen is available for use by the cells. Without going into a discussion of the chemistry involved, just understand that it's the same mechanism involved when acid rain "kills" a lake. The fish literally suffocate to death because the acid in the lake "binds up" all of the available oxygen. It's not that the oxygen has gone anywhere; it's just no longer available. Conversely, if you raise the pH of the lake (make it more alkaline), oxygen is now available and the lake comes back to life. 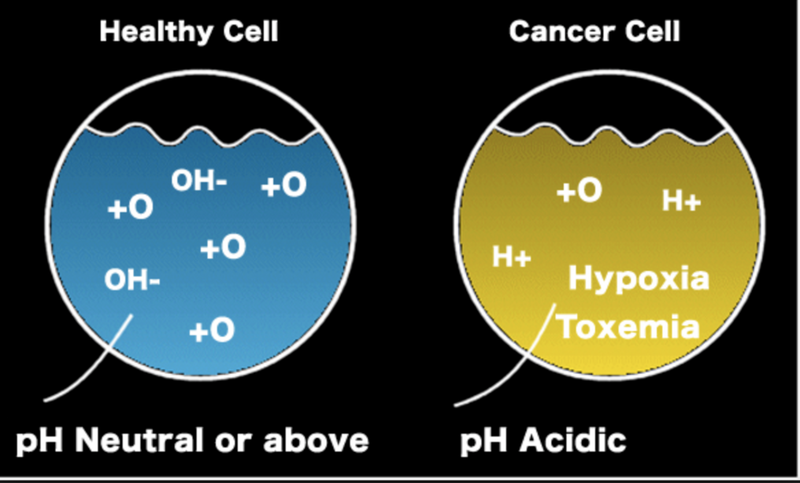 Incidentally, it's worth noting that cancer is related to an acid environment (lack of oxygen) — the higher the pH (the more oxygen present in the cells of the body), the harder it is for cancer to thrive. Understanding this is important for two reasons: (1) it reveals one of the primary benefits of alkaline water — more "available" oxygen in the system and (2) it explains why alkaline water helps fight cancer. Obviously, it is desirable to deliver the sodium bicarbonate as close to the tumor as possible since its pH-raising effect is needed in the microenvironment of the tumor. Therefore, directly injecting sodium bicarbonate in the tumor site is considered a better solution than oral administration. However, oral sodium bicarbonate is just safer and can be readily used at home. In Dr. Sircus' book, he documented how one patient used baking soda and blackstrap molasses to fight the prostate cancer that had metastasized to his bones. 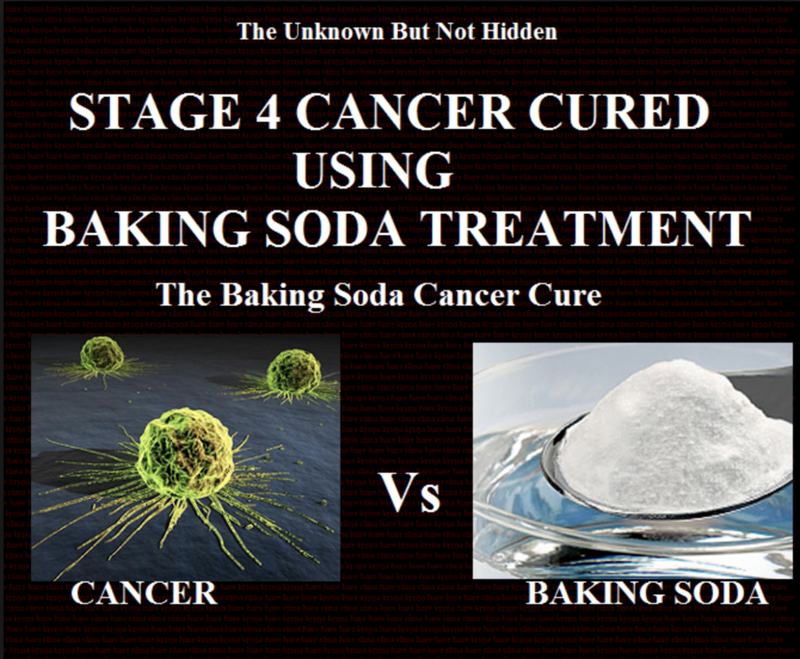 On the first day, the patient mixed 1 teaspoon of baking soda with 1 teaspoon of molasses in a cup of water. By the 10th day, the patient's pH had risen to 8.5 and the only side effects experienced were headaches and night sweat (similar to cesium therapy).